"I'm surrounded with a lot of things to do, and I don't know where to start." Most people including me are living with vast anxiety and unseen stress, thinking like that. 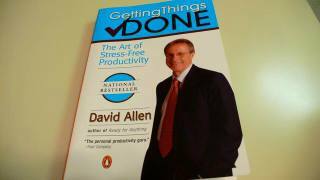 This book, "Getting Things Done - The Art of Stress-Free Productivity" by David Allen would offer you a kind of solution for this problem. The key concept is very simple; list up all the things you think you should do and deal with them one by one. It's important to forget everything, once you have list it up until you start to deal with it. This idea looks so natural and persuasive that quite a few people are dealing with their own todo's along with this book, which has become almost a bible for them. Basically I agree with this idea, but I felt confused when I read through this book first, because the definite method shown in this book is too complex for me. I'm actually facing against a confusing situation right now, and I really need this kind of method, but I feel it is difficult to practice this book as is, so I've decided to adopt only the key concept of this book and arrange the detailed way by myself.